Why Do I Need To Know Holiday Shipping Deadlines? For online sellers, getting orders out on time is crucial for a successful holiday season. Last-minute shoppers will expect ways to make a purchase days before December 25 and still get it on time. If you want to guarantee delivery by Christmas, you need to know which carrier services to use. At ShipStation, we want you to delight your customers during the holidays. It’s important to tell your customers the last days to order if they need it by Christmas. So, we’ve compiled all the 2018 holiday shipping deadlines for the major carriers in the US. View the 2018 Holiday Shipping Dates for International Mail. View the last days to ship to Canada and Mexico. See the full 2018 year-end holiday schedule. *In select areas. See Amazon Prime for more info. How Do I Use These Cutoff Dates For My Business? Take these shipping cutoff dates and figure out the order-by dates for your customers. Consider the expected processing time you’ll need during this busy peak season. You might still be able to to pull off same-day turnaround, or you might need a few days before the deadline date. Use these dates as your building block for what you want to offer at checkout. With the shipping cutoff dates above, we also put together a handy timeline graphic that shows you what services are available. 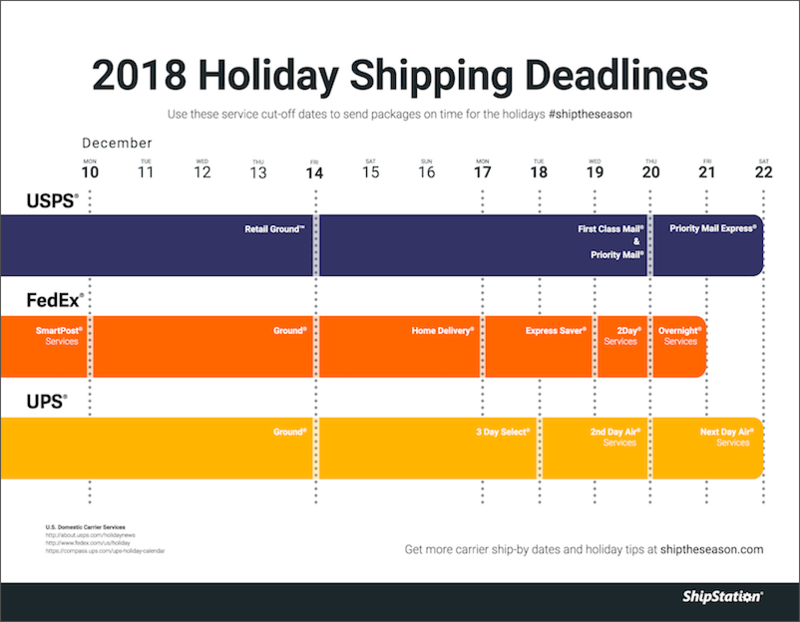 If you use our holiday shipping deadlines infographic to start your holiday prep now, you’ll have plenty of time to calculate your own shipping cut off dates. And once you know your shipping schedule, you can start optimizing your shipping workflow to handle increased order volume. Plus, you’ll have more time to decide on which shipping promotions are best for your business and your customers. You won’t miss a shipping deadline with these screen backgrounds downloaded to your devices! Do you have shipping deadlines for international packages? We want to offer USPS first class international for free to our Canadian, UK, and Austrailian customers this holiday season. Nice info! Thanks for sharing this informative article. You clearly explained all the services holiday shipping deadlines. I have noted some points from content. Hopefully, it will work for me and even I would definitely suggest these to my friends too! Thank you. Wonder if the National Day of Mourning affects this chart in any way? I don’t believe the USPS closures on December 5 will affect package deliveries by Christmas with any of the domestic services listed on the chart. In holidays, the market and economic growth increases by few percentages and rates. Every shipping company in Vancouver and logistics are well aware of their customer requirements and needs. Therefore, they prepare well and make sure they provide on hand services to their clients.